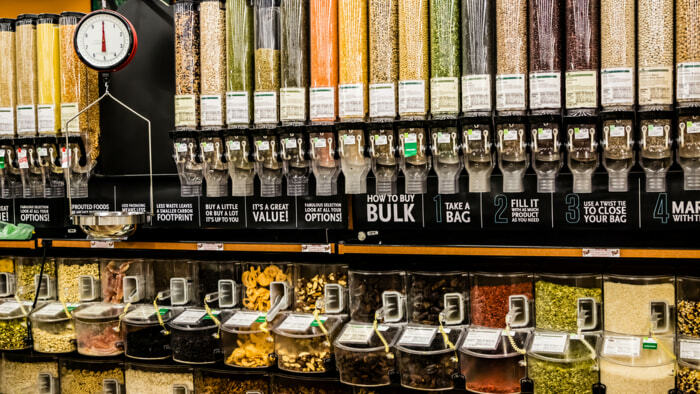 It's cheaper, it's fresher and it often offers the best variety in pantry staples: shopping in the bulk food aisles is becoming increasingly popular, with more and more grocery stores offering larger sizes or expanding their existing selection. Bulk foods also require less packaging and are more efficient to ship, so they have a pleasingly green aspect, too. According to the Bulk is Green Council, bulk foods can cost up to 89 percent less than packaged foods. But even if the savings aren't always that high, they're significant enough to merit adding the bulk aisle to your routine. Another plus is the exciting types of foods you'll occasionally encounter in a good bulk food section—that's how I found out about bamboo rice, black garbanzo beans and black barley. It can be a bit intimidating when faced with rows of bins, so knowing a few things beforehand will help you make the most of your shopping trip. A busy store with a popular bulk foods section will have a quick turnover, so you'll know you're getting fresher food. This is especially important with bulk spices, since spices lose their flavor quickly. Incidentally, bulk spices are where you'll have the highest savings. Bulk foods are usually, but not always, a better value, so it pays to do your homework. Take note of the prices of packaged foods and compare them to what you plan to buy in bulk. Every now and then—either because of sale items or some other fluke—you'll actually save money getting the packaged version. If I don't have a notepad handy when I'm browsing in the aisles, I take photos of the shelf tags of non-bulk food so I can remember the price per ounce. Then I compare it with the price per ounce of bulk food. Bulk food prices are often given per pound, whereas packaged food prices are usually per ounce, so just use your phone's calculator function to crunch the numbers. RELATED: Which grocery app is right for you? It's not fun to pull a bag of bulk flour out of your grocery sack and have it dust you and your kitchen because there's a tiny hole in its seam. So once you fill your plastic (or paper) bag at the bulk bin, slide it into another bag for an extra layer of security. Lots of stores offer useful take-home information in their bulk food sections. Unlike packaged foods, bulk foods don't automatically come with cooking instructions—you won't have the advantage of a box to glance at, so you'll need to figure out cooking times on your own. If the store's already doing that work for you with free recipe cards, you might as well take advantage of them. Occasionally, there will be simple preparation instructions right on a bulk food bin's label. Take a photo of the label so you can refer to it later. Also, at stores with extensive selections, the label will tell you if what you're buying is organic, where it was grown or produced and sometimes who made it. For instance, the company Bob's Red Mill supplies a lot of bulk foods sellers, and often that will be on the label of the bin. I'm a fan of Bob's Red Mill products, so it's nice to know what I'm getting is not only a good deal, but a superior quality product, too. Most bulk food bins have a PLU (Price Look-Up code) number. The checkout clerk will need to know this number when he or she rings you up, so make sure to write it neatly and visibly on the bag, label, or twist-tie. This will get you out of the checkout lane faster and make a busy clerk's day a little easier. For your own reference, write the item's name on the label too. If you're buying multiple types of flours or lentils, they might look all the same once you get home. 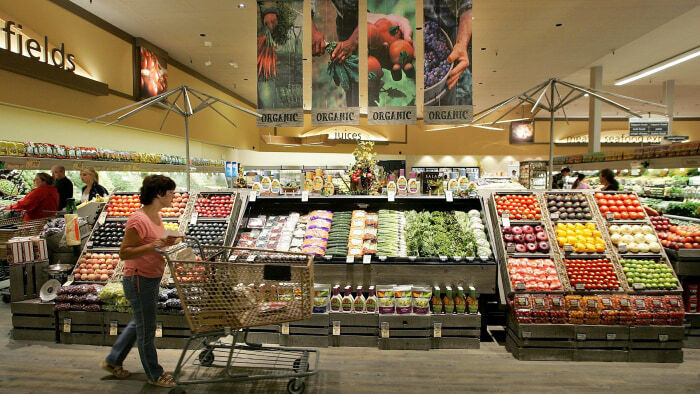 A Safeway customer browses in the fruit and vegetable section at Safeway's new "Lifestyle" store July 18, 2007 in Livermore, California. Safeway unveiled its newest Lifestyle store that features numerous organic and natural foods as well as expanded produce, meat, seafood and floral departments. The store also offers freshly made desserts and baked goods, a coffee roaster, a fresh nut bar and wine section with over 2,000 wines, some of which are stored in a climate controlled wine cellar. Some bulk food stores are chronically short of writing utensils for jotting down the PLU. If you have your own pen handy, you won't need to take turns using the store's lone pen with five other bulk food shoppers. Before leaving for a year-long international trip, my brother gave me all of the food in his kitchen. This included a massive bag of bulk sunflower seeds—five pounds of them—that had all gone rancid. I wound up throwing them away. Unless you're only able to make trips to a store with a good bulk foods section a couple times a year, only get as much of something as you think you'll use in the next several months. Even though many bulk foods are shelf-stable, you still want to use them up while they're nice and fresh. Also, if you're trying a food for the first time, be conservative with the amount you get—you might discover you're not that fond of it once it's cooked I learned this the hard way with a few unusual varieties of beans. They're now used as pie weights for blind baking. However, bulk food bins are a terrific way to try out small amounts of new-to-you foods without committing to a whole box. When my family visits a certain natural foods store, my husband goes a little bonkers in the aisle that offers bins of cookies and yogurt-covered fruits. That's fine, but don't let sugary foods' proximity to healthy foods, like chia seeds and wheat berries, allow you to think you have a free pass for mindless snacking. Cookies and candy are still cookies and candy, no matter what section of the store they come from. Shapeless and floppy bags filled with beans, rice and flour are not easy to store and can get obscured by other items in your cabinets and freezer. Save and re-use empty containers of non-bulk food like glass pasta sauce jars and the cardboard canisters that once held your packaged oats. Label and date the containers so that at a glance, you'll know exactly what's in that tin or jar and how long it's been kicking around your pantry. Nearly any whole-grain flour keeps longer in the refrigerator or freezer. The same goes for most seeds (such as pumpkin, sunflower, and flax) and nuts (walnuts and pine nuts in particular). Brown rice will be good for about six months at room temperature and white rice lasts for a few months longer. Most dried beans will be good for about a year—keep them any longer and they won't go bad, but they will take longer to cook and tend to be tougher. If you keep your foods on open pantry shelves that get lots of exposure to light, try to stick with opaque storage containers, not glass jars or translucent plastic. Light can damage the flavor and nutrient value of whole-grain flours, nuts, and seeds (this is why ground flaxseed is often sold in dark packages). Sara Bir is a chef, recipe developer, and author of The Pocket Pawpaw Cookbook. Tags: today, bulk is green council, there is money to be saved by buying bulk foods rather than their packaged counterparts.